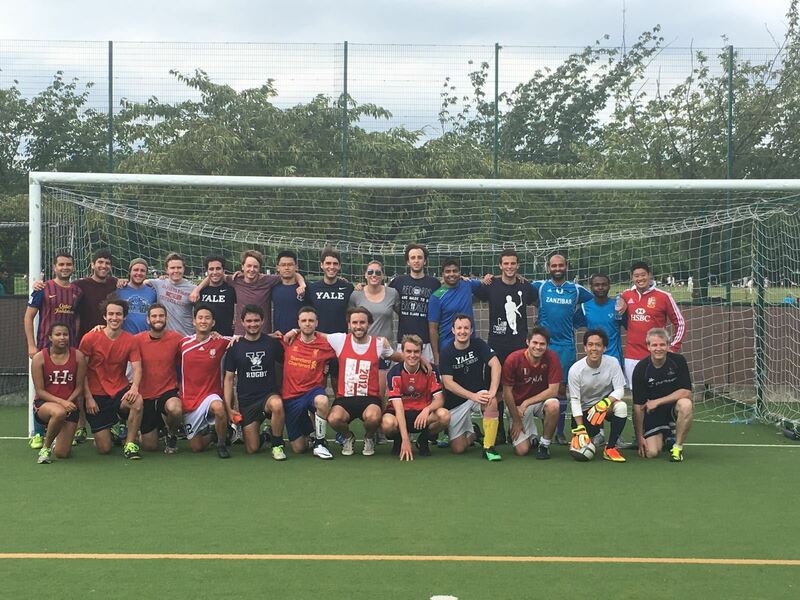 The annual summer Yale vs. Harvard mixed football match (soccer) in Battersea park, followed by a combined Yale-Harvard 4th of July drinks at a nearby pub. Please note: According to the rules of the all-weather pitch, no football boots are permitted: no moulded, no bladed, and no studs. The (soccer) Game is back! Come out and play or support your fellow Yalies in the annual Yale vs. Harvard clubs of London soccer match on the July 4th weekend. It is a full 90 minutes match on the Battersea all weather pitches, and we need all the turnout we can get – players of all levels are very welcome. Supporters are encouraged to come and cheer your fellow Yalies on from the touchline! After the match there will be a joint Yale/Harvard July 4th drinks at a local pub (location tbc), all supporters and friends are welcome. In fact, if you know of any Yalies who used to be members, perhaps ones who have played in previous years, but have let their memberships lapse, definitely encourage them to come along. Players and supports are encouraged to wear as much blue as possible, and bring along any Yale banners to help the cause! According to the rules of the all-weather pitch, no football boots are permitted: no moulded, no bladed, and no studs. If you want to register to play, please do so via the YCL website. The cost of the pitch is £5/head (if any issues with this, please reach out). If you have any questions or want further information about the event, please email Nikita Tsukanov. Let’s get a strong team and good crowd out in support of the Bulldogs! Click here to register. Sun Gate is the best place to be dropped off because of the Formula E race track being built (many areas are restricted). It's then a short walk due east to the ground. The gate is situated at the junction of Albert Bridge Road & Prince of Wales Drive, and is a pedestrian gate only. The post code is SW11 4NJ as most taxis now use it. Postal address - All Weather Sports Ground, Battersea Park, Albert Bridge Road, London SW11 4NJ. a) Battersea Park Station: Served by trains from London Victoria, London Bridge and Clapham Junction. b) Queenstown Road Station: Served by trains from London Waterloo and Clapham Junction, both stations are approximately 5 minutes walk from the park. a) The nearest station is Sloane Square (District & Circle Lines) approximately 20 minutes walk, or bus 137.
a) Battersea Bridge Road: Buses 49, 170, 319 and 345. Alight at junction with Westbridge Road. Approximately 5 minutes walk. b) Battersea Park Road: Buses 44 and 344. Alight at any stop between Albert Bridge Road and Queenstown Road. Less than 5 minutes walk. c) Queenstown Road: Buses 44, 137, 452. Alight at Battersea Park Road for southern part of park. Less than 5 minutes walk.